It’s been said that prevention is always better than cure, which is why we place an emphasis on creating healthy teeth and gums from the beginning of a patient’s dental journey. We focus on preventative measures such as check-ups and hygiene appointments, as well as providing treatments such as fluoride and sealants for additional protection. Your child’s consultation will also allow us to evaluate their airways and tonsils; if needed, we can provide early intervention or advice. Regular check-ups to maintain healthy teeth and gums are recommended from the age of two and a half years. We can detect and discuss any concerns about speech, tongue posture, thumb-sucking, and ensure that tooth brushing is carried out correctly and effectively. If your child has any anomalies in tooth eruption, we can identify them and if needed, correct or watch them. 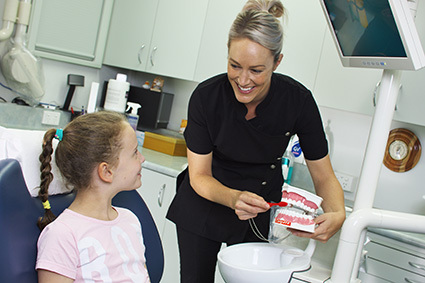 Another important benefit of regular check-ups at a young age is they allow your child to get used to our dental environment, team and equipment, helping to alleviate any feelings of anxiety or stress. Jackie Edmunds, our Oral Health Therapist, is a cherished member of our team who loves working with children and patients of all ages. Not only is she highly-trained and experienced, but she also takes a gentle, caring and fun approach when treating the youngest of patients. Jackie finds it gratifying to help put all of her patients at ease so they can enjoy their dental visits. Avoid using whitening toothpastes as they are abrasive and remove tiny layers of enamel. Electric brushes are preferable to manual ones. Consider getting an oscillating one such as the Oral-B® Vitality toothbrush. Brush your gums, even if they bleed. In fact, plaque is the reason they are bleeding! Remember to brush your tongue too as the tongue harbours bad breath-causing bacteria. Make sure your child uses an age-appropriate toothpaste. Teach your child to spit and not rinse. To ensure that your child is brushing thoroughly, parents should assist with brushing until their child is at least 8 years old. Don’t use mouthwash unless specified by your dentist. Most mouthwashes on the market contain alcohol and have been linked to oral cancer. Keep your teeth in tip-top shape by booking an appointment today!